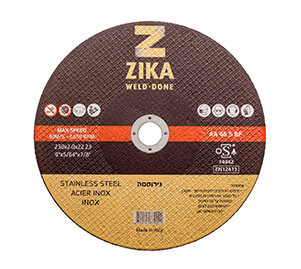 Inox Thinline Cutting Discs – Zika Industries Ltd.
Home Catalog Abrasive Products Inox Thinline Cutting Discs – Zika Industries Ltd.
Inox Thinline cutting discs are characterized by comfortable working and high cutting speed. Due to the fact that the disc does not contain iron, it does not corrode the stainless steel surfaces. Used for cutting all kinds of Stainless Steel products. Our discs are manufactured in Italy, OSA approved and for use in angle grinders *.